The artist’s book pays homage to the Sudanese writer Tayeb Salih, whose novel of the same name, a 20th century masterpiece, fathoms the fiery topic of migration from South to North and the pain of retuning home. A cornerstone of postcolonial literature, the work explores the dynamics of interaction between so-called “civilized” and “developing” worlds, while interrogating the very origin and validity of such notions. Season of Migration to the North was originally published in the Beiruti magazine Hiwar in 1966. Dar al Awda also published the novel in its first edition in Beirut in 1967. The English translation followed in 1969. 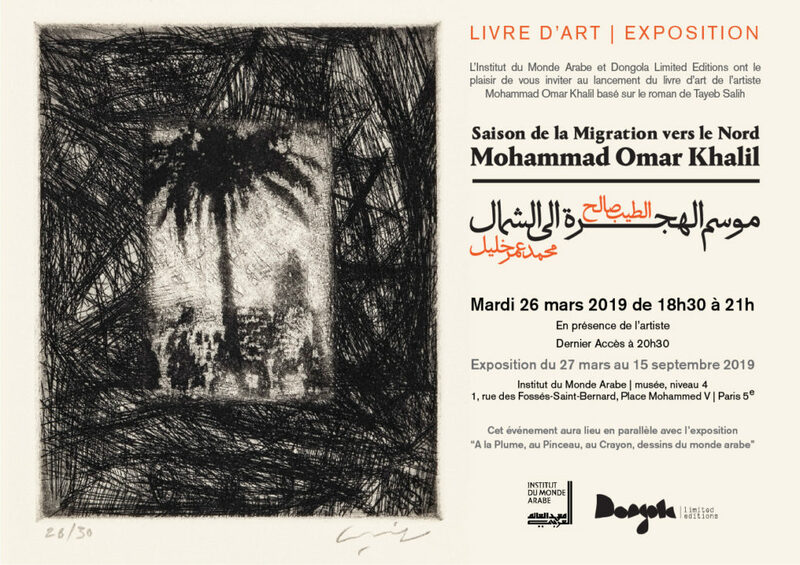 Now, 50 years later, Dongola is publishing Season of Migration to the North in a unique re-edition capturing Khalil’s profound intellectual and visual connection to the novel. Ten original etchings depict scenes from Salih’s Season of Migration to the North. Dialoguing with the novel, the etchings constitute a visceral response to a work lodged deep within the artist’s memory. Khalil’s works accompany a distinctive re-edition of the Arabic novel, designed by Reza Abedini, itself graced with an original etching on the cover. Alongside the Arabic version sits a secondhand copy of its English translation, sourced from online retailers—an indication of the novel’s mobility and continued influence on East-West dialogues. Under the direction of co-founder Abed AlKadiri, Dongola crafts works of critical and artistic reflection through the very process of book-making. The etchings and two novels are nested in a hand-made box with a wooden interior and zinc exterior. Such materials are a nod to the hybridity of Season of Migration to the North, and a testament to the publishing house’s commitment to craftsmanship and exquisite production values as a vital part of its artistic process.